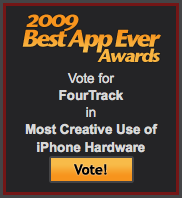 Retroblog: Vote for FourTrack as the Best App Ever! Vote for FourTrack as the Best App Ever! FourTrack is one of the final nominees for the "Most Creative Use of iPhone Hardware" in 148Apps' 2009 Best App Ever Awards. Get your votes in here, and spread the word!